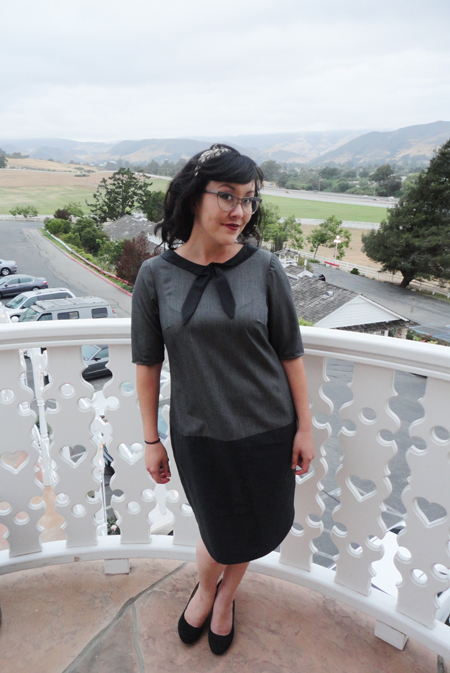 This weekend I finished my dress for The Great Gatsby Sewing Challenge! As you can see, it's obviously not authentic in fabric or pattern, but is loosely inspired by the 20s. It took me a while to decide on what to do for this challenge. 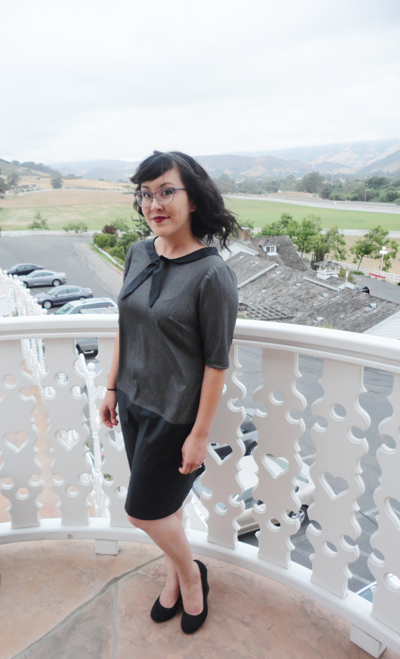 I wasn't sure if I should use a vintage pattern or if I should try and draft my own pattern, but knew that I wanted to make a dress that I could wear again and again. 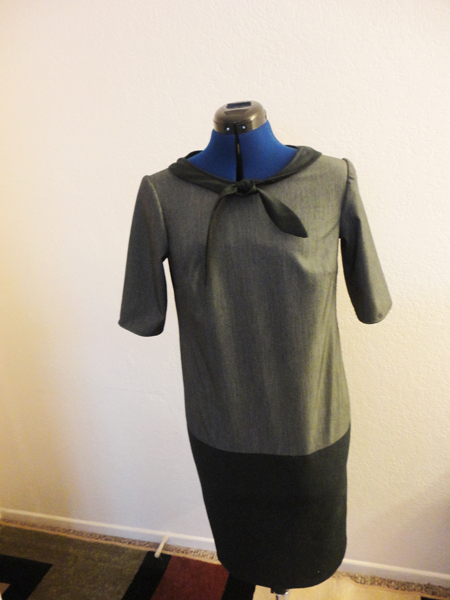 This Burdastyle pattern caught my eye, but right before adding it to my cart I remembered my hatred for adding seam allowances and taping patterns together. I figured I could modify the Laurel pattern to make it work. Luckily, it did! You've probably heard it a million times already, but the Laurel pattern is pretty amazing. It makes up the base of the dress and a modified Jasmine collar tops it off. Spending the extra time to get the fit down on my first version of the dress made making this one super easy. One of my New Years goals was to modify existing patterns because I never do it. Part of me was scared of messing up fabric and part of me just didn't want to fail. When it all comes down to it, it's just fabric, right? I can always order more of these shirtings from Mood, so, I shouldn't stress myself out over it. I'm happy I took the risk because this is one of my favorite makes so far! Had to include a photo of me in front of my garage ;) Oh, in case you are wondering, I didn't cut my hair. My hair is naturally wavy and cut in layers, so I pinned the bottom layers up under the top layers. Instant bob! Super cute! I like how it's 20s-inspired so you can wear it any time without feeling like you're wearing a costume. I've been wanting to make a 20s/30s dress for a while but I haven't done it yet. I have a pattern from that era but it's so fragile I've been afraid to open it. I'll have to bring it by this weekend and show you! Very cute! I especially love the collar. Totally wearable! It looks great, I am loving the collar detail. 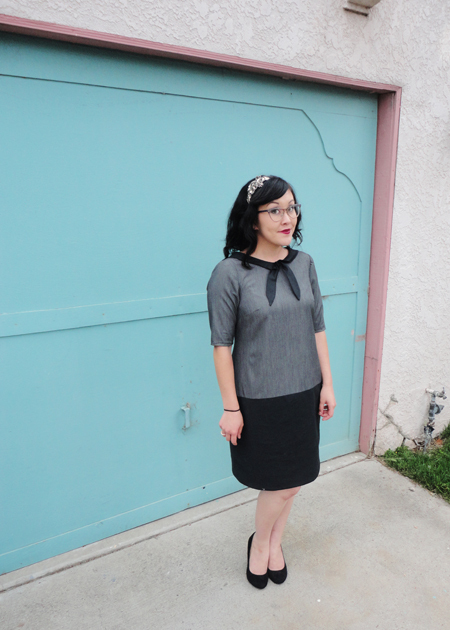 It's lovely, and very everyday wearable - Yay Laurel and modifying patterns!! This is adorable! I love how you modified the laurel. I think I definitely need to buy this pattern. I've seen so many great variations of it. Love your dress! I saw Gatsby for the second time this weekend. The fashion was amazing! This turned out so well! I love the tie especially! it look just lovely, and so wearable for today! So cute, I love the collar! Your dress is gorgeous and really wearable! Unfortunately my sewing machine is on the fritz so I didn't get my dress finished in time :( I'll get it done once my machine back from being serviced! Your dress is great! It's the perfect blend of modern and 20's. Awesome job! SO CUTE!! I think this is my favorite dress you've made. It looks amazing, especially paired with your hair and makeup :) Awesome job, Love. I love your dress, it's adorable! I think it looks very 1920s, but not 'costumy', you could wear this anywhere! This is so cute! The neckline is perfect, and I love that it's '20s inspired but still so wearable. I really like the way you did your hair, too. I love this dress and I too think it's my fav make of yours!! I'm totally bummed I didn't get to join in on this sew along. I've loved seeing everyone's creations. You look great! Just darling! What a beautiful, wearable dress! I looooooove this! It's absolutely adorable! Way to frankenpattern, girl! This is seriously perfect! Really love this dress :) Nice choice on using the Jasmine collar really changes up the dress! Great dress! I love that the color-blocking gives it a faux-dropped waist. So smart!! It hints at 20's but is really modern. Lovely! such a great pattern modification! This so suits you. You clever thing... it looks awesome! :D Well done on modding the pattern! I so want to reuse patterns that I've already done the fitting on. It's so much less work! Love it! The colour combo is great, and the collar is super cute. So cute, and very versatile. Your laurel pattern fits you perfectly. I love this dress! You look fabulous! I might need to make one. Cooooool! I love this dress! What a inspiration ... I like the idea of adding the collar! Unbelievable craftsmanship! A really beautiful dress, thank you for your inspiration! Thank you! I'm debating cutting it, but I can't make up my mind!